Here's my latest still life painting in oil. 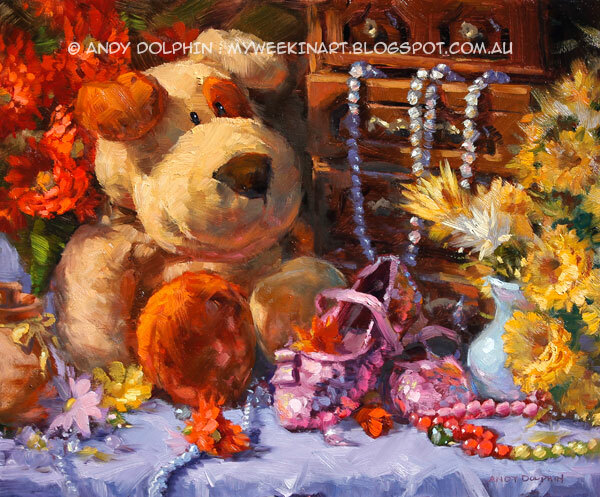 The plushy dog, the vase and the sequined shoes are all op-shop bargains. This was begun as a simple exercise in preparation for a larger painting but I ended up spending quite a bit of time on it. I still think I'll do another version, although I might rearrange a couple of things. I introduced a range of new colours to my palette for this one, including a violet, sap green, a transparent yellow and two rosey reds. I felt that with a subject like this, I needed some vibrant colours that I wouldn't be able to mix from my standard set.